In the above, I just showed an instance where we can use Checkfox addon to mass check the check box. It is not only limited to twitter related to web apps, we can use Checkfox addon any where on the web page which doesn’t have Select All option for Check boxes. Why you Need Checkfox Add-on? If you are a frequent user of twitter mass follow/unfollow or any other web apps which you need to select the check box one by one instead of having a single check box to select all check boxes then on that time Checkfox addon is very useful and it save lot of time. 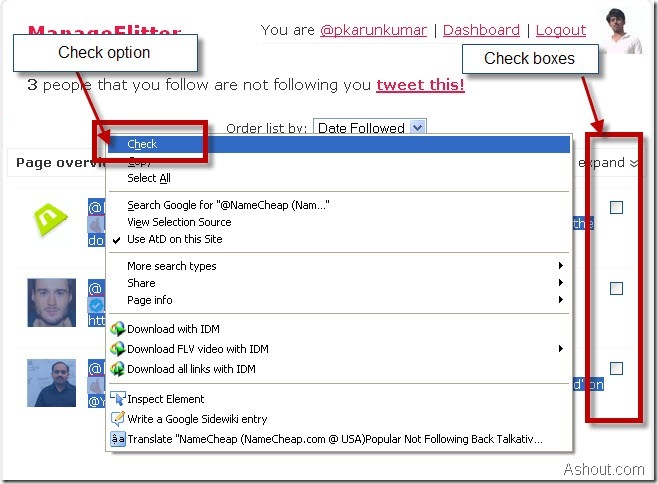 After installing Checkfox add-on visit any website which doesn’t have Select All option for the check box. For example visit: http://manageflitter.com/start.php and connect your twitter account. After connecting your twitter account with Manage Flitter it shows list of people who don’t follow back you on twitter. And on the Right side you will see the check boxes to select the users. Instead of selecting one by one just select the text which contain the check boxes or simply press Ctrl+A in Keyboard and Left click on that page. When you left click on the webpage you will see the “Check” option just select it to check all the check boxes of the selected text. That’s it. Now onwards you can easily check the multiple check boxes in a single click. It’s what i was looking for hope it’s still working thanks..